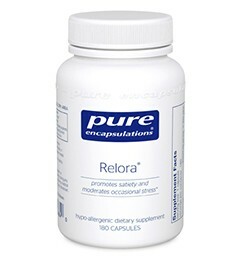 Relora® is a natural, proprietary blend of Magnolia officinalis andPhellodendron amurense. This synergistic combination of extracts helps promote positive mood and moderates occasional stress, in addition to supporting satiety and healthful eating. The magnolia and phellodendron fractions may bind to key central nervous system receptors, including those for GABA and the serotonin transporter, which encourages feelings of satiety and relaxation. A pilot clinical trial reported that Relora was well tolerated and helped promote emotional well being, muscle relaxation and moderated occasional stress. A follow-up trial reported similar results, as well as indicated that supplementing with Relora may help diminish stress-related sugary snack cravings and promote healthful eating habits. An animal study further demonstrated the supplement's ability to support mood and relaxation. A recent pilot clinical trial performed in Cincinnati, Ohio, suggested that magnolia and phellodendron helped to maintain healthy cortisol and DHEA production and metabolism, which helped support healthy body-fat distribution. D-alpha tocopherol succinate (vitamin E).......................................200 i.u. Other ingredients: modified food and corn starch‚ silicon dioxide‚ hypo-allergenic plant fiber.